New commercial satellite imagery indicates that China and the DPRK have accelerated the development of a joint special economic zone, located on Hwanggumpyong Island, near Dandong, China. This suggests that the two countries are moving forward with the so-called Two Islands Economic Zone (comprised of Hwanggumpyong and Wihwa Islands) despite past reports that Chinese officials had suspended the project. Construction began in early fall 2012 and was largely focused in this initial phase on infrastructure improvements and closing off the zone’s boundaries, which appear to encompass over 300 acres. 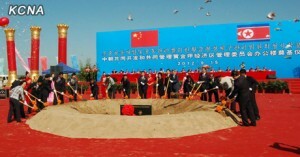 In September 2012, China and the DPRK held a groundbreaking ceremony for a new administrative building to house the Hwanggumpyong Economic Zone Management Committee. Since then, a new entrance to the Island has been built, consisting of customs and security buildings, gate houses, a paved road and a new electrical power line that terminates near the Chinese customs building. Additionally, two areas within the zone have been graded, possibly to house initial industries located in the zone. This work may be the first of a number of infrastructure improvements intended to support the industrial development of the island. Based on the current pace of construction, the zone may be ready for operation in around 2-3 years. Construction at Hwanggumpyong has occurred against the backdrop of reports that China is increasingly dissatisfied with Pyongyang’s behavior. If China is placing pressure on the North, it also seems to be offering continued economic assistance. The bulk of work at the new free trade area has taken place after the December 2012 rocket launch that triggered Chinese support for UN sanctions against the North. Nevertheless, Chinese companies appear to have been heavily involved in most of the construction since equipment probably enters the zone via a new road from their territory. There is no road into the zone from the DPRK side, although North Korean workers either live on the island or may enter by foot through a gate in the southeast corner of the zone. In June 2011, China and the DPRK announced an agreement to establish a special economic zone on Hwanggumpyong and Wihwa Islands, two largely undeveloped North Korean islands in the Yalu River adjacent to the Chinese border city of Dandong. 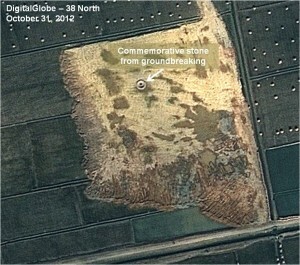 Despite the fanfare of the announcement, satellite imagery revealed little or no activity at the site for more than a year. 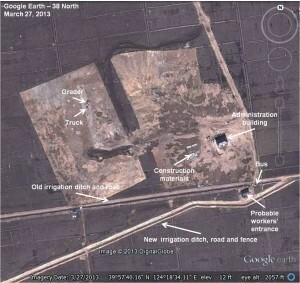 Although Yonhap reported that the Chinese Ministry of Commerce invited about 20 North Korean economic government officials and scholars to Tianjin for training in special economic zones in May 2012, the lack of physical progress at the site resulted in rumors that the “Two Islands Economic Zone” was in serious trouble. In June 2012, South Korean and Japanese media outlets reported that China was “reconsidering” the project as a result of economic realities and Beijing’s growing displeasure with North Korea following the April missile test—reports that caused enough consternation for both China and the DPRK to deny them. During a visit to Beijing in August 2012, North Korea’s Jang Song Thaek and Chinese Minister of Commerce Chen Deming announced the establishment of an administrative committee for the economic zones in Rason and the Hwanggumpyong and Wihwa Islands. Following Jang’s visit, Yonhap reported that China dispatched about 70 specialists from Jilin Province to North Korea to help accelerate progress on North Korean special economic zones (SEZs). Most importantly, on September 15, 2012, China and the DPRK held a groundbreaking ceremony on Hwanggumpyong Island to begin construction of an Administration Building for the Hwanggumpyong Economic Zone Management Committee. 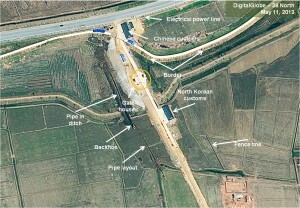 North Korean and Chinese officials indicated that, following long delays, infrastructure improvements would commence. Pan Shuang, Vice Mayor of Dandong, explained that roads and other infrastructure were now under construction. Figure 1. Groundbreaking ceremony for an Administration Building. Satellite imagery confirms that new construction began in early fall 2012, shortly in advance of the formal September groundbreaking. 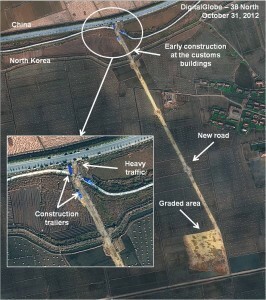 China and North Korea started building a main access road in August and grading a rectangular area at the end of the road where the administrative building now sits. One month later, that graded area had been expanded to the south and construction had begun on customs and security buildings along the road at the zone’s entrance. 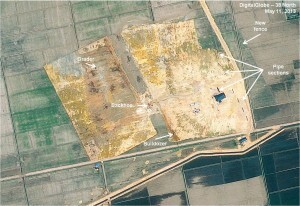 By May 2013, imagery indicated that activity had continued with the boundaries of what may be the first phase of zone construction better defined. 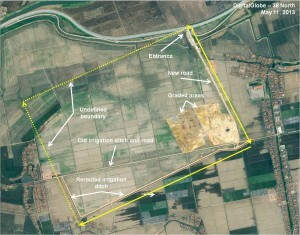 The layout appears to be a rectangle with the east side about 0.9 km and the south side 1.36 km in length and follows a new irrigation ditch with a dirt road and fence. The west side probably follows the right angle turn of the new irrigation ditch at least until it rejoins the old ditch. It may eventually intersect the northern boundary line but both of these cannot yet be seen (figure 2). The zone appears oriented with its boundary lines, new roads, fences and buildings on azimuths of 155/335 degrees and 65/145 degrees. If this layout is accurate, the area will encompass about 122 hectares or 302 acres. Figure 2. Possible Phase I layout of the Hwanggumpyong Economic Zone. The centerpiece of the new construction appears to be a building intended to house the administrative committee of the Hwanggumpyong Economic Zone. North Korea and China have established a joint “Hwanggumpyong Management Team” (sometimes called a managers’ board or management committee) that will oversee the development of the zone. Images released by KCNA show Chinese and North Korean officials shoveling dirt around a “commemorative stone” next to the site of an office building for the Hwanggumpyong Economic Zone’s management board. Figure 3. Site of the commemorative stone, no building construction seen. The administration building appears to have been built between September 2012 and March 2013, suggesting that any Chinese displeasure with Pyongyang due to WMD-related activities did not slow progress at Hwanggumpyong Island. Recent images show the administration building is complete and the depression around the commemorative stone has now been filled to ground level. Chinese officials made clear that the next step to attracting investment in the Hwanggumpyong Economic Zone was to modernize the island’s infrastructure. Over the past six months, a new entrance into the zone appears to have been nearly completed. It consists of two identical 7 x 20 m customs and security buildings, two gate houses, a paved road and a new electrical power line that terminates near the Chinese side customs building. In addition, a pipeline was being laid from the entrance alongside the road to the newly graded areas to the southeast. Figure 4. Infrastructure improvements underway towards the end of 2012. Figure 5. Entrance to the Hwanggumpyong Economic Zone built up by May 2013. Two rectangular areas that have been graded to eliminate the old irrigation ditches and agricultural fields are in the southeast corner of the zone. The cleared area closest to the new road seen in the October and November 2012 photos is the location of a two story 12 x 23 m administrative building now finished. The graded area has been expanded and encompasses about 6.14 hectares or 15.2 acres. Immediately to the west is a second graded area that measures 4.76 ha (11.75 ac) in size. Figure 6. Two cleared areas seen in March 2013. With the exception of the administrative building, there is no evidence yet of construction. Nevertheless, these graded areas may house initial industries located in the zone. Because they had been used for agriculture with multiple irrigation ditches running through them, filling in the ditches and grading the ground is required before foundations for buildings can be constructed. Imagery from May 11, 2013 shows that an old irrigation ditch and road have been bypassed. The water has been diverted into the new ditch and the road has been blocked. Just across the old road from the cleared area is a 6 x 17 m new building that is probably the North Korean workers’ entrance. A white bus has been seen at this location in March and May 2013 imagery. The first cleared area and administrative building appear to be using North Korean electricity since a power line parallels the old road and irrigation ditch and a drop off line can be seen running to the administration building. Figure 7. Progress by May 2013.